Join us for this evening of reflection on our current exhibition, Finally Got The News: The Printed Legacy of the U.S. 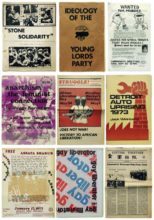 Radical Left, 1970-1979. An ensemble of performers echo the impulses of the 1970’s Radical Left Movement. Theatre and music will collage the diverse social movements defining a vibrant decade. This event is part of an exhibition that is funded in part by a Humanities New York Action/Vision Grant.